I appreciate you sharing your thoughts here. I believe you misinterpreted my position on Mr. Robertson. I am not defending him in particular. He rambles much and I am not going to put myself in a position to defend his every remark. I actually agree that his word choices crossed the line into vulgarity. Still, his overall point that homosexuality is a sin is the Biblical and historic Christian position. That is increasingly becoming a dangerous position to hold and has resulted in lost employment for several people. It violates a constitutional right to free speech on the one hand, and is singling out Christianity on the other. That is bigotry. As for his racial comments, I never even heard of that until last night after I wrote the article. His comments seemed to be a personal observation for the black people he grew up around. Still, he can defend himself on that one. To stand by someone on a particular event is not to stand by them in every thing said or done. I respectfully stand by the persecution I mentioned. That is the big picture, as I said, and dwarfs the person of Phil Robertson. I realize that some pastors have said ill-advised comments in standing by the Biblical position on homosexuality. If you read the article I linked at the bottom of this post, you will see I believe that and criticize it. Still, it is our right to state the Biblical position when every opinion against it is allowed and encouraged. I thank you for writing and will leave your comments here for others to consider. Thanks for replying. There is a terrible misconception of what exactly free speech is in this country in terms of the constitution. This man’s constitutional right to free speech hasn’t been violated. The constitution guarantees that Congress or any other Government entity can not silence us because of what we say. Robertson hasn’t been silenced he can continue to hash out all of his opinions for as long as he wants. He isn’t constitutionally guaranteed to keep a reality show job afterwards though. Freedom of speech is not freedom of consequence. Again, A&E is not a government entity and has the right to dish out necessary consequences to their employees. A&E is not the church and its dangerous to suggest that because A&E decided to take these actions so will the government against the pulpit. To stand with a bigot despite you now knowing about his racial remarks AFTER you wrote this article is disheartening. I will continue to pray that the heart of Jesus meets us all in this situation. I see your point about speech versus consequence, and that A&E is a private enterprise, but I think, perhaps, you are not noticing what is going on in our country. What about people losing real jobs for holding a Christian position? What about being forced to cater a gay wedding if it violates your conscience? These are real problems and they are a form, not life and death, but a real form of persecution. That is my issue, not Duck Dynasty per se. You also said nothing about the vulgarities in his statements, I am 100% sure this type of vulgar language found in this GQ interview where he referred to male and female genitalia in obscene and sexist ways is being duplicated in the pulpit of the church. This man wasn’t speaking up the Christian morals and values that I or a majority of the Body of Christ can agree with. If his language is representative of Christ’s values and morals then we are serving a different Christ. I have been pondering this myself. I agree that his statements were not only in violation of Ephesians, but also of I Peter where we are told to be ready to give an answer but to do it with gentleness and respect. I feel that Phil Robertson did neither of those. However, my biggest problem is not with how he said what he believed but the politics and political correctness of the left wing and how they have reacted. Personally, I would have not handled the situation like he did, but….I must stand up for the inconsistency of the liberal agendas as they are trying to get rid of all biblical values. So it comes down to two issues: 1) what is Gods view and am I willing to take a stand with that truth and 2) what is the politics and do I believe in freedom of speech. I believe in both so I must side with his belief and his rights….even if he stated them wrong. 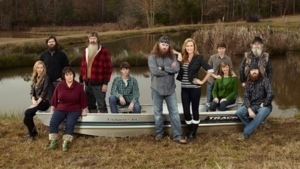 No one has ever said that the Robertsons are the perfect family of perfect Christians, they are however the only thing close to a Christian family on TV. Phil was crude, but in comparison to let’s say Miley Cyrus or Jay Z, Phil was very tame. His speech was coarse, and his quotes of the Bible not perfect, but the idea was expressed accurately. Just like happens every 4 years with republicans, the conservatives of this country eat their own, while the liberals don’t care one bit about what skeletons you have in your closet. Sure A&E is a private company, but still it’s an idea… and legal speech is protected from consequences – just try being a Christian owned private company and then fire someone for expressing anti-biblical beliefs on their own time… you will lose big… Christians were to be salt and light, we have stopped being both, and have become good for nothing but being trodden under foot as our Lord taught in Matt. Thanks for sharing James. I have heard several that feel exactly as you do! Reblogged this on Truth Triumphs: ProliferateTruth.Net.